A 25-truck convoy carrying food and medical aid will enter the besieged, rebel-held town of Douma in Syria's eastern Ghouta on Thursday, Ziad Msallati, a senior adviser in the Syrian Arab Red Crescent, told Reuters on Wednesday. A convoy with food and medicine managed to get into eastern Ghouta last week amid a massive army assault to recapture the enclave on the outskirts of the capital Damascus. UN Syria adviser Jan Egeland, who is also head of the Norwegian Refugee Council, said the Syrian government had given its approval for a convoy on Thursday. "This would be potentially a fairly large convoy with food and hopefully as much as possible of the other material that is in desperate need there, including medical supplies," he said. But nothing was certain until the trucks unloaded, he added. 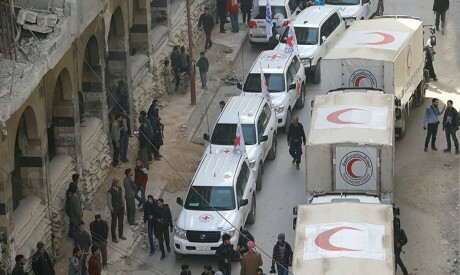 The last convoy to eastern Ghouta, like many previous aid deliveries in Syria, was stripped of medical items that the Syrian authorities did not want to fall into rebel hands, a move that appeared to breach humanitarian law. Egeland said the fighting had diminished around Douma after talks with the main insurgent group there, Jaysh al-Islam, which had enabled the evacuation of 147 people to Damascus. But he was not aware of any such talks with Faylaq al-Rahman, the main rebel group in the other rebel-held part of eastern Ghouta, Kafr Batna, which has been split from Douma by a Syrian government offensive. Egeland said it was not too late to negotiate a peaceful end to the fighting there though many people were disillusioned with peacemaking after seven years of war and assumed it was hopeless. "I don’t think it's hopeless. We can have an agreement for Douma, we can have an agreement for Kafr Batna," he said. Such a deal would bring an immediate pause in the fighting to stop the "rain of grenades and bullets" on civilians and to allow aid convoys in and evacuees and people needing medical treatment out, he said. That would be followed by a deal "to end this senseless battle in an area full of civilians".